Posted by alwaysjan in Gardening, Hobbies. Growing up, my gardening experience was limited to weeding one very small strawberry patch, which was also our dog Holly’s favorite pooping spot. To this day, I always wash strawberries one more time – just in case. In the suburbs, people didn’t actually garden as they were too busy slavishly maintaining The Lawn. One of my enduring memories is of driving past our neighbor’s house and seeing him sitting out in the front yard after dinner every night with a bucket, methodically digging up dandelions. Night…after night… after night. What a monumental waste of time, I thought. You go to work all day in a cubicle (though cubicles had yet to be invented and popularized by Dilbert) and come home to THIS. But I was young, so what did I know? In 1996, we bought our first house and the pipeline of “Better Homes & Gardens” began flowing (Thanks Mom). I realized that I actually liked getting my hands dirty and watching the bugs and worms scuttle off when I overturned a rock. (See Bugs Don’t Bug Me.) Rabid do-it-yourselfers, my husband and I broke out the concrete patio, then meticulously reset the broken pieces of concrete in a bed of mortar with a scattering of polished black stream stones. In the middle of our new and improved patio, we planted two queen palm trees inside a 3-foot high circular concrete planter. My husband and I personally hand-mixed 42 bags of concrete to pull this off in a day (with only one emergency trip to Home Depot to buy MORE concrete). When I look at the planter now, the only logical explanation for undertaking such a project is demonic possession. We planted a variety of plants around the base of the palms. Strawberries for our pig (above dog pooping level), some bulbs, a succulent, and ivy so it cascades over the top of the planter, which is outlined in bricks. One night my husband noticed I was hovering over the planter, which I’d come to do more often than not. Night…after night…after night. I fussed over every incursion by a weed and meticulously clipped away any leaf that dared to go brown on the tip. What was happening to me? I’d started teaching, and I’m not exaggerating when I say that my first three years of teaching, I had horrible classes. Horrible. I’d often come home feeling overwhelmed and then have to start calling parents about what their little darling had done that day. It was incredibly stressful. That’s when it hit me. So much of my life was out of control, and the one thing I felt I could control was a little patch of dirt. Suddenly, my heart went out for that neighbor from my childhood. After a day at a mind numbing job, he was out picking dandelions most likely for the same reason I was hovering over my “garden” with manicure scissors. To keep his sanity. To keep his head from exploding a la Scanners. What better place to clear your head, but in the garden, where you can lapse into the rhythms of nature and use your hands to do something besides double click. I can’t think of anything more zen than whiling away quality time in the garden, allowing your soul to feast on the beauty of the natural world. I’m feeling settled as a teacher these days, and my newfound serendipity shows in my gardening, which is sporadic and in spurts. My husband likes to say there’s nothing I like better to do than sit out in the dirt. It’s true, I’ve no need for those high tech knee pads, as I just plunk myself down and get to work. I’m a Taurus and that IS an earth sign. I wonder. You know, I think that’s one of the nicest compliments my husband has ever paid me. Posted by alwaysjan in Gardening. It was already 9 a.m. and Steve aka The Yard Guy still hadn’t arrived with his crew. I was always under the impression that on a hot day, it’s best to get an early start in the yard. Before the sun’s rays turn to UV 10 Death Rays. Evidently, Steve hadn’t heard of this, so I thought it best to call and give him a head’s up. “Hey, what’s happening?” Steve said, sounding way too casual. “What’s happening is nothing is happening because you’re not here,” I replied, trying to sound casual though my teeth grinding was now audible. “I’ll stop by in 10 minutes so we can talk about what you want to do,” he said. Click. Wait a minute. He’d said, “I” and not “we.” What was there to talk about? It was Monday morning and my friends from England were arriving in 36 hours. I called him right back. “You’re not just coming by yourself,” I said. The desperation in my voice was now palatable. “I’m bringing the guys,” Steve reassured me. Now, I’m not one of those conspiracy nuts, but this is my theory. I believe when I called Steve, he and “the guys” were probably parked around the corner. I imagine they were just finishing their breakfast burritos while waiting for my panicked call. This way, at the last possible minute, Steve and his crew arrive like the cavalry come to save the day. That is if the cavalry travelled in a big white dump truck. Just hearing the sound of Steve’s truck rumbling out in the alley set me to salivating like Pavlov’s dog. I’m convinced this is all part of Steve’s Master Plan. Can you see how brilliant it is? “So what were you thinking you’d like to do?” Steve asked as though this was the first time we’d ever talked about the job. Meanwhile, Steve’s crew had swarmed over the backyard, devouring all traces of rocks, roots, and the dreaded grass. They moved so quickly, if I blinked, it was like watching time-lapse photography. I retreated inside to sit in front of the fan. “I think Steve is going to pull this off,” I said to my husband, Richard. I spoke too soon. Here’s what Richard swears he observed. Only two hours later, one of Steve’s guys gave a signal. Richard even demonstrated by cupping his hands over his mouth. It sounds sort of like an owl hoot, “Who, Who! Who, Who!” Indians always use this signal in the movies, even in the later films where they’re Native Americans. According to Richard’s account, all of the workers immediately grabbed their tools and ran out the back gate. We’re talking minutes here. Que pasa? I tried to be optimistic. It was lunchtime and Steve’s truck was still parked in the alley. But where were my worker bees? “Maybe they got called away on a lawn emergency,” Richard offered. But the only lawn emergency I know of goes by the acronym INS. Well, the money led to Chris and Chuck, my two gay (as in two disposable incomes) neighbors. They were hosting a sit-down party for 100 the night after our stand-up party for 35. Their guests would be served $10 wine. My guests would be shown where the beer can opener and corkscrew were. At the last minute, they’d decided to tear out their front lawn and put in a new one. There was also the small detail of having someone scale a 100-foot palm tree so it could be lit so as to be visible from outer space. Ka-ching! This constituted a lawn emergency, so my backyard had been triaged. Unfortunately, Steve had dramatically dumped the load of DG out in the alley in front of our garage door, so we were trapped. Late Monday afternoon he sent some guys down to shovel the DG to the side. The cavalry then retreated in their white truck. “Manana!” Steve shouted as he disappeared in a cloud of dust. I woke up Tuesday and felt as though I’d received a shot of adrenalin directly into my heart (a la Pulp Fiction). We had 12 hours. To ratchet the stress level up a notch, Richard was trying to finish the guest bathroom next to the garage. It was tiled with slate and featured two holes. We’d called Luis from El Salvador to help paint and grout. My friend Christine called and made the mistake of asking how I was doing. I said, “It’s December 24th at the North Pole and all of the elves are on crack.” Alarmed, she drove over to see for herself. There hadn’t been so Latinos from different countries assembled in one place since the School of the Americas disbanded. One hour before we had to leave for the airport, Steve’s guys finally rolled the pieces of the fountain into position. This was akin to throwing Stonehenge together in a day. Richard flipped the switch, and water began to trickle. We had lift off! 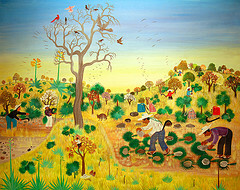 Posted by alwaysjan in Art, Going Green. Our artist friend Bobby, who lives in Las Vegas, has upped the ante in the “Lawn Be Gone” challenge. Tired of shelling out $225 to water his lawn, Bobby pulled the plug in March. His water bill for June was a whopping $9. 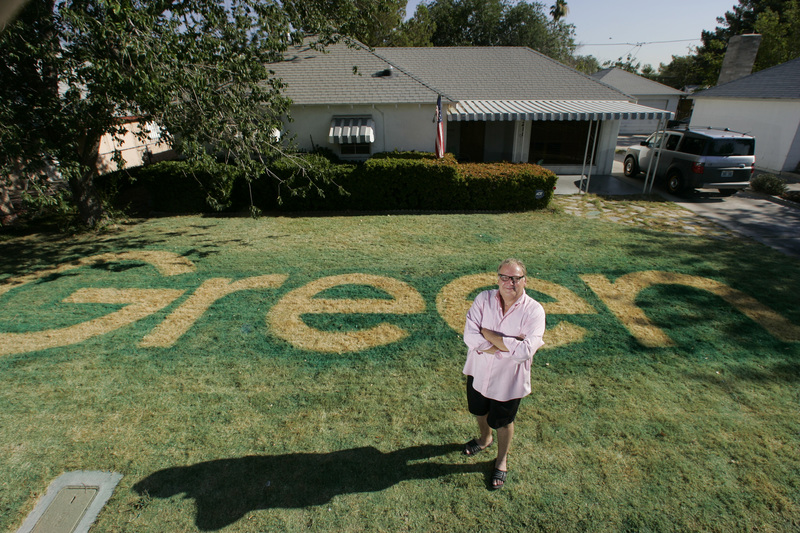 Since spray painting his lawn, a growing number of people are pulling over to snap photos. And no, he doesn’t just stand out front waiting for these photo ops. Bobby’s story was featured this week in the Las Vegas Sun. Bobby has spent the last decade in Vegas painting custom interiors and murals at the major casinos. Years back, Bobby lured Richard up to Vegas to help design the interior of the Voodoo Lounge at the Rio and Richard still has the T-shirt to prove it. Nothing like starting to paint at 10 p.m. and knocking off for breakfast. Construction was 24/7 so the artists were relegated to the night shift. Richard remembers that the only place he could go in Las Vegas to escape the sound of the slots beside Trader Joes, was the Las Vegas Public Library. Half the male population of Michoacan is currently in my backyard brandishing chainsaws and harpoons. Oh wait, those are tree pruners. Que paso? I broke down and called Steve aka The Yard Guy. I left a voicemail. Something about the lawn. This morning I was awakened by a distant rumble. It grew closer. I imagine this is how the French felt during WWII when they first heard the drone of approaching Allied tanks. Liberation is at hand! I listened as the troops, I mean trucks, grew closer. Then there was a long silence. Maybe I was mistaken. I looked out my bedroom window just in time to see half a dozen men jump the back fence and drop into my yard, like an elite SWAT team in full assault mode. The dogs were going crazy. Within minutes, working like locusts, they swarmed over all things green in my backyard, cutting and pruning. I looked up to see a limb from the ash tree ricochet off the roof of the shed. Steve’s crew had arrived. But donde esta Steve? One of the workers walked into the kitchen. Since our back door is usually open, I don’t particularly find it odd that a stranger is wandering through my house, usually looking for the bathroom. He motioned that he needed me so, still in my pajamas, I followed him out to the alley. I was still awaiting the arrival of Steve. After all, we hadn’t even discussed what we wanted him to do or most importantly – a price! Since I’m a teacher, I won’t see another paycheck until Oct. 1st. Although I’m not counting pennies yet, that day will come. Finally, Steve made a brief appearance. He’s a big blond surfer-looking dude who grew up across the street. He put in our sprinkler system 12 years ago and we call him from time to time to trim the trees. We and Steve have a history. I don’t think I’ve ever seen Steve when he wasn’t wearing his signature wraparound shades. He directs his crew in rapid fire Spanish. “Steve, we need to talk about price,” I remind him. “I’ll be ’round later to talk about it, ” he promises and I know he won’t and he knows it too. It’s just a dance we do. It was Steve, himself, who told me “Broken Promises” is his middle name. But Steve has one saving grace. He’s really good at what he does. Make that two. He’s fair. And he has a great smile to boot. Today Steve’s crew pruned and cut everything from the ground up. Never mind that I never mentioned pruning trees or the roses for that matter. Now all the greenery is perfectly coiffed – maybe a little too perfectly. And there’s still that pesky green lawn that needs to go bye-bye. That’s why we called Steve in the first place. Posted by alwaysjan in Gardening, Going Green. I should have listened to my son, Taylor, years ago when he suggested we just pour bleach onto the lawn to kill it. Of course, his motives were not altruistic or even vaguely environmental. He just hated getting up early. Fast forward ten years. It seems that all my neighbors are going native, and we’ve finally decided to join them. My neighbors down the street, Travis and Nichole, were the first to stop the IV drip of precious water to their lawn, which takes up an entire corner lot. This was cause for alarm. My next door neighbor, Dex, took us aside one day. “Have you talked to Travis and Nichole lately?” he asked. “I’m a little concerned,” he added. “Have you seen their lawn? I think you might want to go round and check on them.” I knew this was planned obsolescence on their part, so I played dumb. You have to understand that Dex takes pride in still doing his own yard work. He’s retired. He wears the weekly chore of mowing, edging, and raking like a badge of honor. Maybe that’s because he was invested in Boy Scouts for so many years. Dex confided that when someone’s lawn looked as bad as Travis and Nichole’s did, it was possible that something “had happened” to them. He was giving me permission to be the first one to discover their decomposing bodies. When I finally told him what they were up to, he looked relieved, then puzzled. Why would someone want to roll up the green carpet that is the hallmark of suburban living? We’ve decided to leave the lawn out front alone – for now. For one thing, our mower is almost new. We traded in the old gas hog two years ago, when the city encouraged people to upgrade to an electric mower for $100. We now have a mint-green lawn mower that looks like it was made by Fischer-Price. It doesn’t roar and belch gas fumes. Instead, it contentedly hums along for a week a time before requiring a recharge. I feel like a model citizen whenever I’m out front using it. Look at me! I’m saving the planet! The back lawn is an entirely different matter. I’m tired of filling in the bare spots between the stepping stones with plugs of grass like a highly trained technician does at regular meetings of the “Hair Club for Men.” We have a large patio. But beyond the arbor, anything goes, as opposed to anything grows. 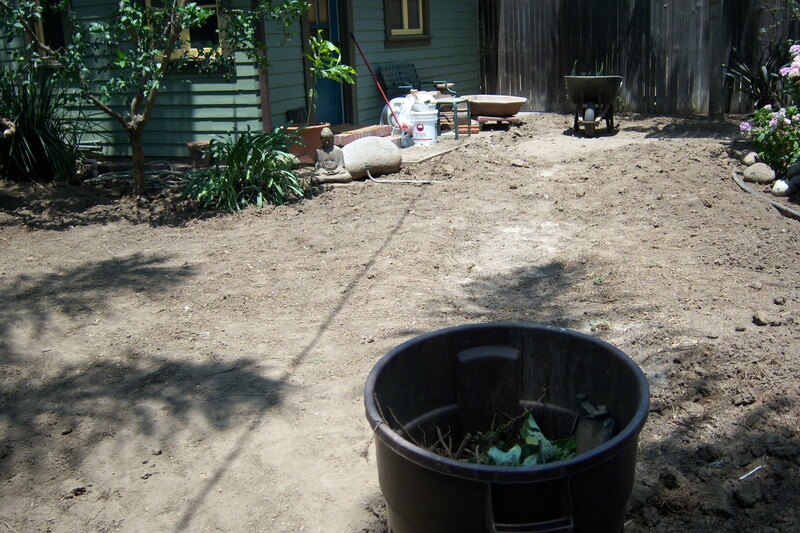 My approach is to simply rip out the grass and spread the dirt around like one big zen garden. 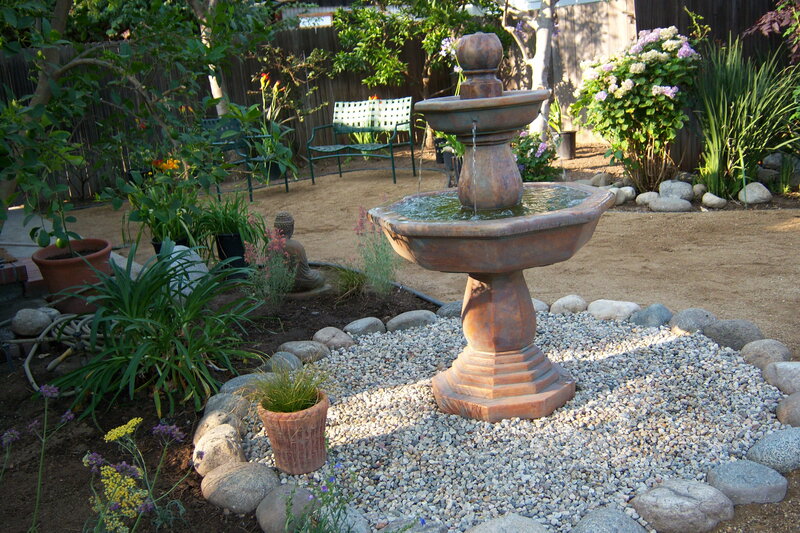 Bring in a load of decomposed granite and plug in a fountain. Oh, and I’ll take some of those native plants too, the ones with the large saber-like leaves that you could become impaled on. Voila! My husband is appalled by my lack of foresight. He feels the need to purchase a hardcover book at Vroman’s so he can pour over gorgeous photographs of other people’s gardens. Most likely, other rich people’s gardens. People for whom price is no object. Then he wants to spend his spare time (as in, I have no time to spare) working on a master plan. Then…you get the drift. At that rate, I can just wait for global warming to do the job. Nichole actually took a class in how to plant a native garden and carefully selected the plants that are just now starting to fill in. Why reinvent the wheel? Talent borrows, genius steals. No, I didn’t say that. That’s T. S. Elliot, and I think he was onto something. Our other neighbors, Stuart and Brenda, showed us their new backyard, which is awash in pea gravel and square pavers that float serenely in a sea of round black pebbles. It helps that Stuart is a film set designer and has an amazing eye, along with a cache of props he’s collected off of TV shows. I have Cost Plus. Let’s just do it! I think Richard is starting to budge. I reminded him of how much it would cost in gas alone just to drive to Vroman’s to buy a book. He’s starting to cave…To Be Continued.